Experience the amazing Grand Canyon National Park and the Red Rocks of Sedona on this one day tour from Phoenix. Stop for pictures of Sedona and its Red Rock beauty on your way to the magnificent Grand Canyon. Visit the Navajo Reservation. Experience the Grand Canyon. You will see this Wonder of the World from multiple viewpoints. This is an amazing journey to some of the most picturesque areas on Earth! This tour departs from select hotels in Phoenix, Scottsdale, Tempe and Mesa in the early morning. You will travel through Oak Creek Canyon on your way to Sedona, one of the most picturesque places in the Southwest. After a stop here for photos, you will head to the Cameron Trading Post on the Navajo Indian Reservation. Here, you will have time for lunch (not included in tour price) and browsing among the thousands of Native American crafts and artifacts. 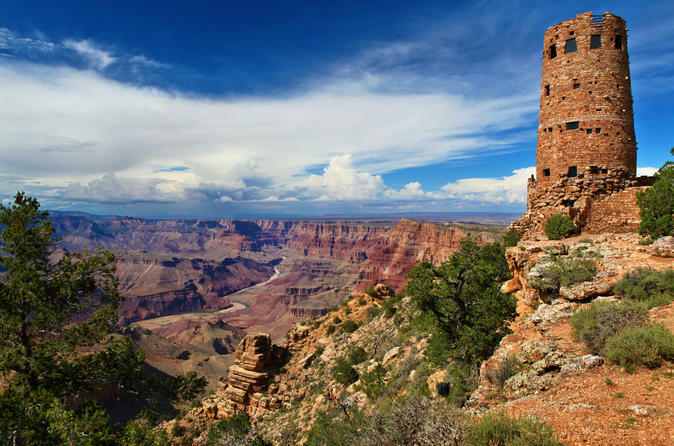 Your next stop will be the Grand Canyon National Park. Here, you will stop at multiple viewpoints along the Desert View East Rim drive, so you can walk around, take lots of pictures, and even go right up to the edge of the Grand Canyon if you wish. You can explore the historic El Tovar Lodge and Mary Colter’s Hopi House. On the way back to the Phoenix area, you will make a stop for dinner (meal not included).